If the kids are happy, comfortable and occupied, the adults will feel happy and relaxed too! That’s why we have aimed our house at making sure the children enjoy themselves. We’ve themed two of the bedrooms so they can feel more at home, put TVs in every room, some have DVD players and one has a PlayStation 2 (American Games/DVDs only). There is also a 52” projection TV in the lounge. There are 2 master bedrooms with pool access and ensuites, a double bedroom and two twin themed rooms . The pool/spa is south facing with a covered lanai too. The game room has a pool table, air hockey table and foosball. There is also a dartboard and various board games. We are a family of 4 living on the south coast of England and our children have 10 years between them. We struggled to find holidays that would occupy the age gap of our children and so decided to visit Florida where we knew there was something for everyone to enjoy. We were hooked ! We stayed in hotels but found that as the children grew up, we needed to pay for 2 hotel rooms and with both of them being energetic, space became a problem. We also missed cooking for ourselves, and also quite fancied having a private pool. A friend suggested staying in a villa and we have never looked back. We decided to purchase our own villa a few years ago and we are very pleased to have done so. Now our eldest goes out there with his friends every year too. We were shown around a number of properties and were advised to consider single level villas over two storey houses as this would make it easier for multiple families. This particular villa ticked all of the boxes. I.e. 5 Bedrooms, 4 bathrooms, a private pool and spa and most importantly, close to all of the Disney Theme Parks.We were surprised at the amount of space these villas have and the high ceilings make them look even more so. We love having our own south facing pool and the covered lanai is very useful for the shade.The game room is such an added bonus too. Indian Creek has 2 parks a couple of minutes walk away and tennis courts. The local shops and restaurants are within easy reach and there is also a medical centre. En-suite bathroom to bedroom 1 with corner bath, large shower, wc and twin vanity unit. En-suite bathroom to bedroom 2 with bath/shower over, wc. Bathrooms 3 and 4 with bath/shower, wc. Double sofa bed, 2 double sofas, 52" projection television, dining table, chairs for 6 people. Cooker, hob, dishwasher, microwave, dining area for 4 people plus breakfast bar, coffee maker, fridge/freezer. The Orlando area is home to over 150 golf courses. The conditions are near perfect all year around for golfing, although it gets a bit humid in the summer. Courses local in Kissimmee include: The Celebration Golf Club, The Grande Pines Golf Club, Falcons Fire Golf Club, Orange Lake Country Club, to name a few. Outside: Outside the pool and spa are fully screened. 4 sun loungers and table and chairs for 6 persons are provided for outside dining. Pool/spa heating are available as required. Utility Room: Washing machine, tumble dryer, iron/ironing board. Towels, linen included. House cleaned pre-arrival. Other: The games room has a full sized slate bed pool table, air-hockey table, table football and electronic dartboard. A selection of boardgames are also provided. A travel cot and high chair are also provided. Such a beautiful home! Everything was clean and very comfortable! Had a great time with my kids and grandchildren, The grandkids love the pool , they could've stayed in all day if we let them . The house had a lot of room, there was nine of us. We had beautiful weather all the time we were there didn't want to leave . We got so much use out of the pool and hot tub here. The house was exactly what we needed as a group of 4 adults who just wanted to relax in the warm weather. The owners were super communicative which made the whole process much easier! 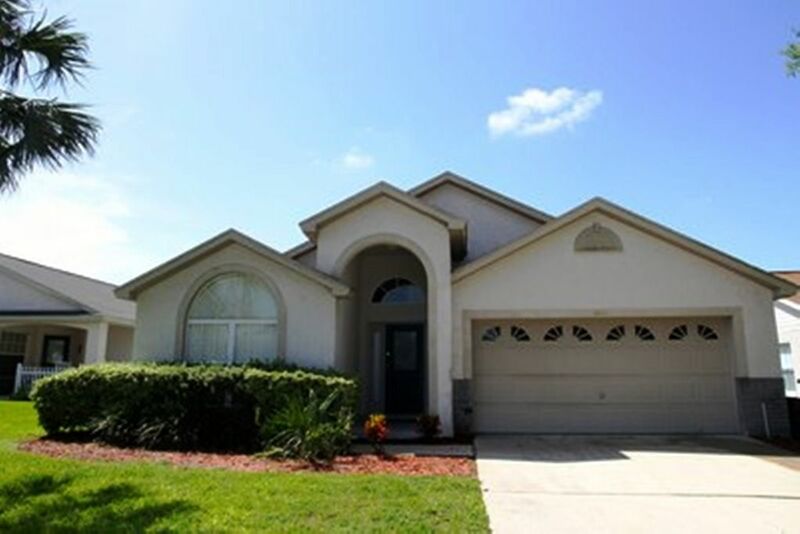 Would definitely recommend it to anyone looking to stay in the Kissimmee area. It was a nice place but really needs to have some maintenance work done and some things replaced and or fixed. It has very old and slow internet but does work. The biggest problem I had was that the pool was not heated and the hot tub did not work which was one of the biggest attractions to the property. Other than that overall the house was nice for the price! The biggest plus was the owner was very good to deal with and very nice. Thank you so much for taking the time to review our property John. In response, I have looked back at your booking and have no record of you ordering pool heat which will explain why it was not heated for your stay. I wold like to apologise for the hot tub not working for you. I have spoken with our agents but they have said they didn't have a report from you to say it was not working. They fixed the problem straight away as it was only a split cap and this was replaced immediately. I always ask guests to contact the agent if there are any issues so they can sort as quickly as possible. Home is pleasantly decorated, with two children's bedrooms done in mickey mouse and nemo motifs. they share an outside bathroom. nice back yard pool that is screened in to protect from insects, with attached hot tub. three master bedrooms w queens; two have inside bathroom and the third has bathroom just outside. nice size kitchen, with dinette table; four chairs. and separate dining room table/area with six chairs. three couches circling living room area. In garage are full size pool table, air hockey and foosball. Owners couln't be nicer, and management company was also helpful. neighborhood is very nice and even has kiddie park in the middle of a few hundred similar homes. Highly reccomended on all counts! Thank you Shelly for such an informative and kind review. It was lovely having you to stay and hopefully we will see you again in the future. We had the most amazing time while away in Florida and a lot of that was down to the fabulous villa we stayed in. Upon arrival we were taken back by the sheer amount of space available. We were a group of 6 adults and were joined for 2 nights during our stay by a further 2 adults and we were not crowded at all. We each had our own space and bathrooms between the couples which was ideal. The facilities are brilliant, from the games room to the pool and the cleanliness too. Sarah and Bob were a simple message away, and had provided information in the villa on local places to go and also contact numbers for help with issues locally. Any queries we had were answered instantly or we could find the information within the arrival booklet. I would also like the mention how brilliant the kitchen facilities were, with ample utensils and all other things you could need. We all can't recommend the villa enough, be it for a family holiday with children or a group of all adults like ourselves. Everything was brilliant and hopefully we will be able to return in the not too distant future. Thanks again Sarah and Bob for making our holiday extra special. Thank you so much Emma for taking the time to review our villa and for your lovely and kind words. It was a pleasure to have you stay there and you looked after the place beautifully. Indian Creek is situated in the middle of Florida and is approx 1 hours drive to either the west coast, (Clearwater, St Pete's) or to the east (Coco and Daytona beaches). Orlando International Airport is approx 1/2 hours drive and Sanford approx 50 minutes. Tampa International is about 1 hour's drive. (Car hire is essential). Booking Notes Changeover day is flexible subject to availability, arrival time is 16:00hrs and departure time is 10:00hrs. Notes on prices: Prices are for the property per week / per night in UK Pounds. 10% discount for bookings of 3 weeks or more. 20% discount for late bookings (4 weeks prior to rental). Pool heating charged at £15 per day. We are sorry but we do not allow pets in our villa.